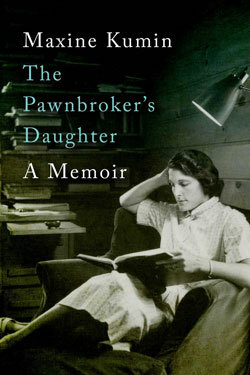 The recently published posthumous publication, The Pawnbroker’s Daughter: A Memoir, draws attention to the powers of endurance of the American Jewish poet Maxine Kumin (1925-2014). The Yiddish word for strength, koyach, might have been the middle name of Kumin, a skilled swimmer and horsewoman who battled back after a near-fatal carriage-driving accident at age 73. As described in her 2000 memoir, Inside the Halo and Beyond: The Anatomy of a Recovery, even the direst moments sparked reactions worthy of a Jewish mother: “While I am pinioned flat on my back, I am almost as black and blue with grief and guilt for causing anguish to my family as is my torn body.” Her athletic appearance in early photos scattered through The Pawnbroker’s Daughter remind us of the Bess Myerson era of Jewish beauties. So sporty and presentable was Kumin that at age 18, she was offered a job as a swimmer in a touring production of Billy Rose’s Aquacade. Her participation was nixed by her father, the prosperous pawnbroker of her book’s title. Instead, she would find prolonged gratification in writing, running a New Hampshire horse farm and raising a family. The full scope of Kumin’s writing, including novels, essays, short stories and children’s books, tends to be overlooked, just as her poetry is not widely read. Part of the reason may be that her personality still overshadows her publications, and her honors, including a stint as U. S. Poet Laureate, may be cited more often than her work. Further, there are some misunderstandings about the role of Judaism in her poetic achievement. but they had a sub-sub basement out of range. A non-Jewish poet would likely not have drawn parallels to the Holocaust in quite this sotto voce manner. Inattentive readers of Kumin’s poetry, referring to her rural themes, mocked her as “Roberta Frost,” an insult to both Kumin and Robert Frost. Kumin’s best poetry finds moral messages in rural life, without assuming the faux cracker-barrel philosopher stance and godly pose unique to Frost. She was always aware of being a Philadelphia-born Jewish pawnbroker’s daughter. Nor have more seriously intended critical comparisons to Elizabeth Bishop, Anne Sexton, Sylvia Plath and Robert Lowell been helpful for understanding Kumin. Like any poetic talent, Kumin must be seen as unique and on her own terms, not according to some prefabricated idea about a group or class of poets. […] I am drawn to such dramas of animal rescue. As much Emma Lazarus as Florence Nightingale, alluded to in the above lines, Kumin combined a Victorian spirit of back-to-nature with sometimes heavily clotted writing of the Pre-Raphaelites. Kumin’s verse could seem prosy at times, naturally enough given her profound interest in novels. At Radcliffe, she wrote an honors thesis, “Amorality and the Protagonist in the Novels of Stendhal and Dostoevsky.” Kumin’s best work, whether in prose or poetry, invites attention to how she assumed her heritage while striving to transcend categorizations. Posterity must one day evaluate Kumin’s literary legacy on its own merits, separating the wheat from the chaff. More than a memoir or the seemingly inevitable biography further focusing readers’ attention on her life and away from her works, a small volume of selected writings—including some of her neglected prose—would be a helpful guide. Benjamin Ivry is the author of a poetry collection, Paradise for the Portuguese Queen. Among his works is a biography of Rimbaud and many articles and translations on poetry, music and the arts.